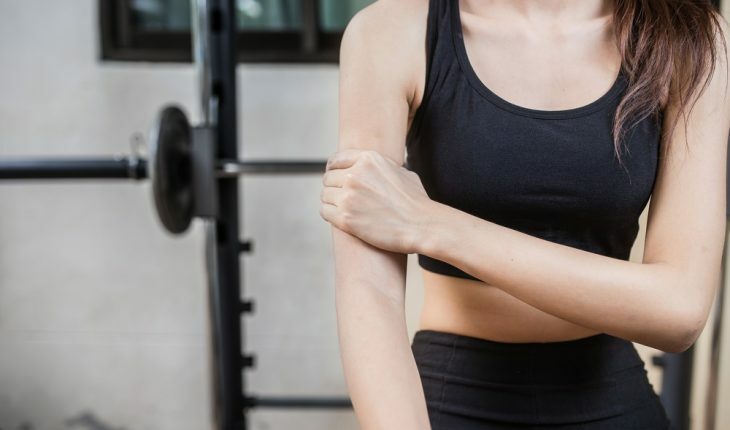 Exercising at the gym offers substantive benefits – weight control, disease prevention and even mood improvement – but it’s important to remember that germs thrive in the gym. And that could put you at a risk for common skin infections, according to the American Academy of Dermatology (AAD), unless you take some precautions. Always wear shoes, especially around pools and in locker rooms or showers. Common conditions include ringworm, which is highly contagious condition and causes a red or silver ring-shaped rash on the arms or scalp; plantar warts, a rough growth on the bottom of the foot that is usually transmitted via indirect contact; impetigo, red sores on the body that are transmitted through direct contact; and athlete’s foot, a contagious red rash that can occur on the bottom of the foot or between the toes. Wear loose-fitting, moisture-wicking clothes. This will help keep your skin dry and prevent germs from growing. Remember to wash your gym clothes after wearing them. Always wear shoes, especially around pools, and in locker rooms and showers. Keep a pair of shower shoes, flip-flops or sandals in your gym bag. Never walk barefoot at a public gym. Keep any cuts clean and covered. Avoid using saunas, steam rooms and hot tubs until your wound is healed. Disinfect equipment before and after using it. Clean equipment with disinfectant wipes or spray. For additional protection, consider adding a barrier, such as a towel, between your skin and shared surfaces, like workout benches and bicycle seats. When it’s possible to provide your own equipment, such as a yoga mat, bring one from home rather than using the gym’s. Wash or sanitize your hands immediately after working out. Shower as soon as possible. After showering, put on clean clothes, including clean socks and underwear. Never share personal care items, including towels and razors. For more information on skin health, click here to visit the AAD website.